As a former mallrat, I feel a little hypocritical when I criticize Minneapolis’ Mall of America. But it is so bizarre. I mean, there’s a freaking amusement park in the middle of it, and three enormous levels of stores around. Mainly I was there to eat, because I never eat sBarro’s or Panda Express except when I’m traveling. Call it comfort food for the mallrat in my heart. Nostalgia aside, I saw this display at the Columbia Sportswear store. 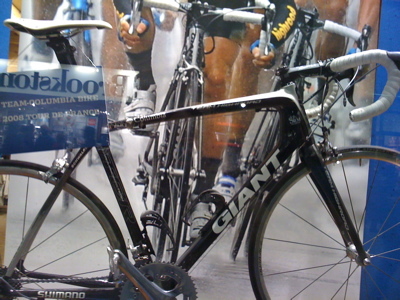 It’s Bernard Eisel’s Team Columbia Giant from the 2008 TdF. What I thought was cool and authentic were the wires at the bottom bracket for an SRM crank that had been removed. Why would the team mechanic leave the pricey SRM Dura Ace crank on the bike if it was just going to sit in a mall in the middle of America?